When it comes to replacing lost tooth structure, dental implants truly go the extra mile. This transformative service faithfully rebuilds every part of the natural tooth from scratch, including the root that’s well-hidden underneath the jawbone. This approach preserves oral health, provides lasting stability, and results in a new “tooth” that can’t even be distinguished from the rest of a confident smile. At Michel Dental, our doctors would love to welcome you in for an initial consultation – contact us today at our Silver Lake or Topeka, KS location! Why Choose Michel Dental for Dental Implants? Lasting Health Benefits : Because implants replace the root of the tooth in addition to the white crown, jawbone deterioration (a common consequence of long-term tooth loss) is no longer a serious threat. As a result, patients maintain better oral health and minimize their risk of additional tooth loss in the years to come. 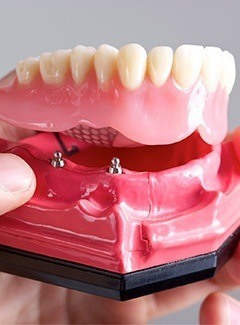 Day-to-Day Convenience : Implant-retained teeth can be treated very similarly to a natural tooth. You can brush and floss them like normal, and there are no major dietary restrictions to follow either. Exceptional Seamlessness : Once completed, implant-retained teeth are very aesthetic, highly functional, and have an extremely similar feel to original dental structure. It’s a virtual certainty that no one around you will notice them at all or think that your smile is any less than 100% natural – unless you tell them, of course! 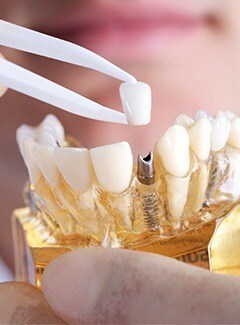 Unsurpassed Longevity : Dental implants are designed to succeed for multiple decades at a time with minimal maintenance. In fact, many patients enjoy their brand-new “teeth” for the rest of their natural lives without issue. Single implants can be paired with all-ceramic dental crowns, which fit right in between natural teeth without requiring any major alteration to your healthy dental structure. It’s likely that you won’t even remember which tooth isn’t original after some time has passed! 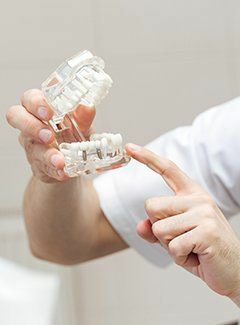 All-ceramic dental crowns can be positioned in multiple places throughout the mouth, although an implant-retained bridge may be a better reconstructive option if a patient is missing multiple teeth in a row. The prosthetic is anchored in place with one implant on either side of the gap to provide maximized stability and support. Implant-retained dentures can work wonders when it comes to replenishing entire arches of teeth all at once! The prosthetic fits into place over a small number of angled dental implants, which makes this tooth replacement option more affordable than supplying one implant per lost tooth. It can be fixed in place or left removable in nature depending on a patient’s preferences. At Michel Dental, we coordinate dental implant care with some of the best oral surgeons and likeminded specialists in our communities. 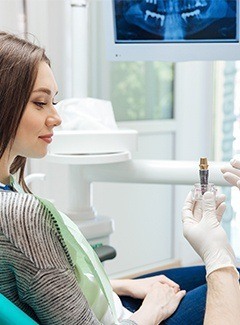 This collaborative approach results in second-to-none quality for our valued patients, and our team members will be sure to keep every stage of treatment running smoothly so that convenience isn’t left by the wayside either. The chosen specialist will surgically place the implant(s) into your jawbone, and our dentists will personally handle the design of the new, beautiful custom restoration(s). 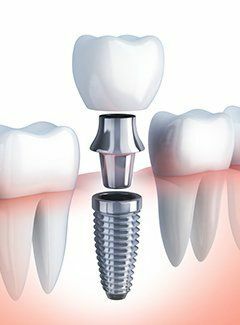 The dental implant procedure has several different components that all incur their own price, including the placement of the implant(s), the addition of an abutment/connector, and the style and number of custom restorations that are attached on top. Thus, no two patients’ cases or overall costs are exactly the same. During your initial consultation, our dentists will review your oral health and discuss the goals you have in mind for replacing your missing teeth. 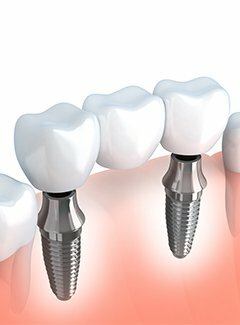 We’ll be sure to provide comprehensive cost estimates for your implant procedure before moving forward with any further treatment. While dental implants have a higher overall cost than traditional bridges or dentures, the investment you’re making is a worthwhile one. While older prosthetics usually require extensive upkeep and even full replacement over time, implants are designed to thrive for multiple decades at a time – this means that you will actually save money in the long run!